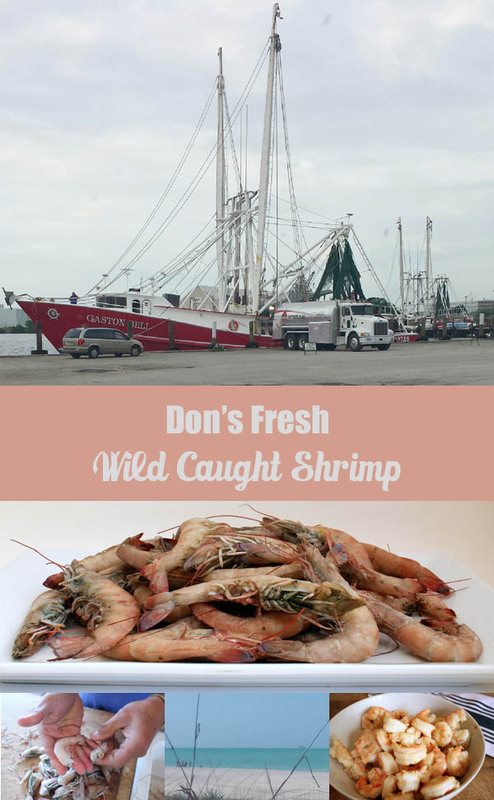 We met Don about a year and a half ago when he discovered that he could get super fresh wild caught shrimp at a good price in southern Florida. He wanted us to set him up as the shrimp guy back then, but there were a lot of things to work out before that could happen. Fast forward to now, and Don is ready to go. The fresh, wild caught shrimp is amazing. He made some for us a couple days ago – best we’ve ever tried. It tastes like the clear blue sea, not fishy at all. The shrimp comes from the beautiful waters of south Florida, it is flash frozen right after it’s caught, and then goes directly into Don’s freezer (in his red van). And he’s now taking orders for delivery this coming Tuesday, where you will pick it up right out of the freezer in his red van. Pre-order at the following link and pick up your fresh, wild caught frozen shrimp on Tues of next week. The locations are limited to what Don can deliver in one day. If it’s popular, he plans to deliver to more locations in the future. *Update: Sign up for our emails to be notified when Don is delivering fresh ocean caught shrimp in your area. They are healthier. Farm-raised shrimp are simply a health hazard. In many cases, the people who grow them won’t even eat them, because they know what conditions they were grown in. They are not required to clean the ponds between harvests, and there are no regulations on what they are allowed to feed the shrimp. Some ponds have been found to be about 20% raw sewage. And that, my friends, is disturbing. Wild caught is better, though, right? Well, the northern coasts, including the east coast, all have a share of problems. Run-off from the agricultural states makes its way into the oceans, near the coast where the shrimp are caught. They feed in the chemical and pesticide-tainted waters, allowing toxins to enter the meat. The shrimp are then gathered, packaged, and sold, and what are we eating? Basically the filters of the dirty water they came from. Gross! These Key West Pink variety of shrimp roamed free in the sparkling waters of the Gulf of Mexico all of their lives. The Gulf is safe from the pesticide run-offs of other coasts, and its white sand bars are beautiful clean feeding grounds for the little creatures. The flesh is firm and white, the meat is sweet, and the shell is the vibrant color of a flamingo, unlike the grey or muddy colors of shrimp in polluted environments. 100% Natural and Wholesome. These are completely wild caught, natural, whole shrimp. They have not been processed or treated like commercial shrimp. When the shell and head are taken off of shrimp, unless you are planning on preparing them immediately after, you loose the natural barrier that protects the meat and keeps the moisture and flavor inside. To combat this, processing plants treat the shrimp with a preservative. It doesn’t even have to be listed on the label. A package could say just “shrimp and water”, and still be saturated in a chemical bath. These shrimp are fresh caught and frozen, that’s all there is to it. Sustainable. 7 C’s shrimp is caught in the Gulf of Mexico, but only in United States waters. These are governed by stewardship regulations regarding catch limits and species permitted to be harvested at a given time. We won’t run out of shrimp anytime soon by responsibly managing the resources God has entrusted us with. They Taste WAY Better! A local restaurant recently did a taste test in which two separate batches of shrimp grits were prepared, one with commercial, farm raised, chemically treated shrimp you can get at the supermarket, and one with 7 C’s wild caught natural shrimp. The tasters were asked to guess which was which, and get this…every SINGLE taster guessed correctly. For a difference that well recognized, there has gotta be something to it, right? The natural shrimp was described as tasting fresh like the ocean or the sea, and having very similar texture and taste to a good lobster. Don’t know about you, folks, but I’m starting to get hungry!